Ian Gregory howling dog - 8½" (215 mm) high. 2000. 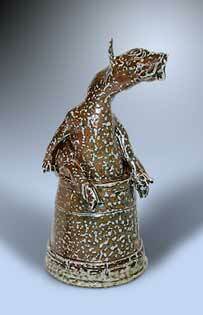 Multi-talented Ian Gregory started in ceramics after ten years of treading the boards. Although he is an autodidact - he learnt to pot throwing terracotta flower pots - he has done more than his fair share of teaching, having taught at Harrow, Bath, Cardiff, Corsham and Medway Schools of Art, and the University of the West of England. His speciality is sculptural ceramics, making life-sized pieces in saltglaze and raku using a technique he developed in 1976. He has written three books on the subjects of sculptural ceramics and kilns, and is an accomplished water colourist and oil painter. His work is exhibited world wide, in such illustrious establishments as the Victoria and Albert Museum in London. His smaller pieces, which he first started as a break from the large-scale sculptural ceramics, are much sought after by collectors.